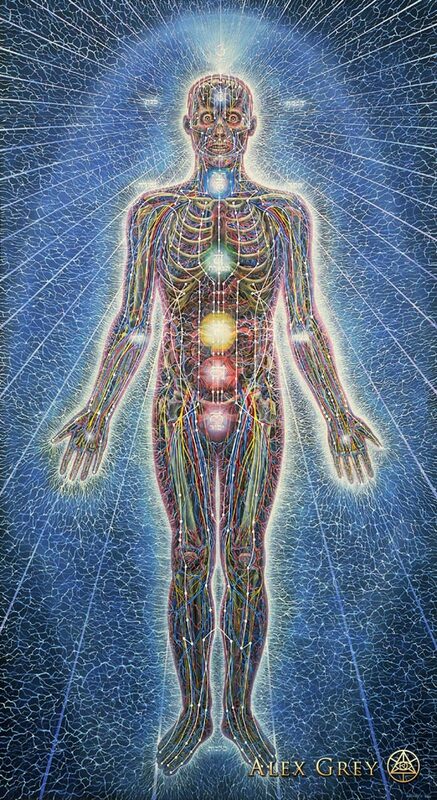 Alex Grey unapologetically aligns himself with a long line of sacred or religious artists, a lineage that was thoroughly broken during the modern era and continues to flounder in what is being called the postmodern era. But Grey has, almost single-handedly, rescued art from its ego-centric, materialistic foray into meaninglessness, irony and indifference and reintroduced visionary art into contemporary culture. A visionary artist becomes an eye witness through direct experience of the divine as a result of mystical experiences. There are many ways in which the artist can have mystical experiences – from a low intensity awakening like being overwhelmed with the beauty of the natural world to a high intensity awakening such as an experience of unity through meditation. It is because of these intense experiences an artist knows how to see rather than merely look. There are three sets of eyes with which we perceive. Our conventional mindset, in what Jonathan Zap calls the “Babylon Matrix,” requires us to limit our vision to our physical eyes and to the eyes of reason. With our physical eyes we obviously look at objects in the outer realm. With the eyes of reason we see the symbolic in order to make conceptual relationships. This is the extent of most modern and postmodern artistic vision. Art is either ultra realistic or abstract to the point of individually assigned meaning. The third way of seeing, the way of seeing with the mystic eye of contemplation, or the third eye, sees the transcendent. This way of seeing, used by visionary artists, is not encouraged in contemporary culture or in art schools because the modern and postmodern mindset denies the existence of, and therefore the possibility of seeing, divine beauty. But the visionary artist sees with all three eyes. 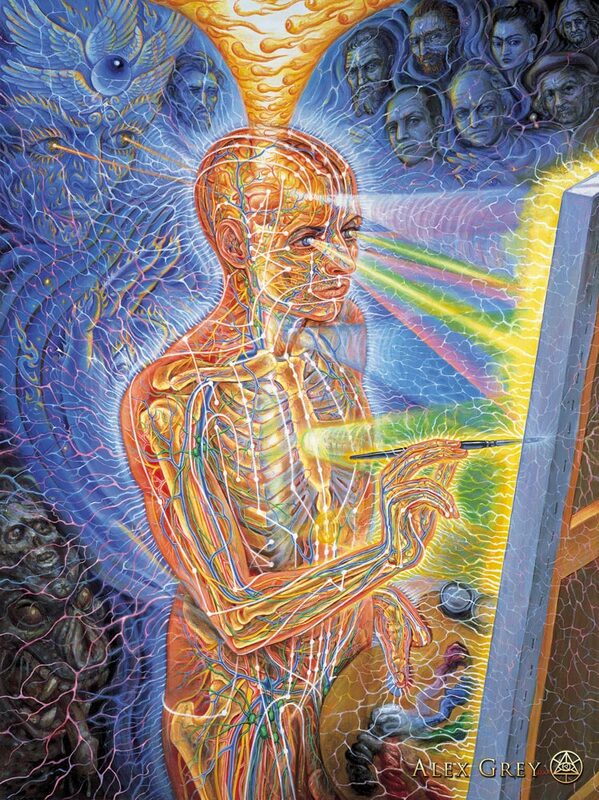 Visionary art is responsible for redeeming culture; for reminding us of our connection with the source of life. Sacred art, from the earliest cave paintings to the great cathedrals, has pointed in this direction because, as Grey says, we are the creative force of the universe.